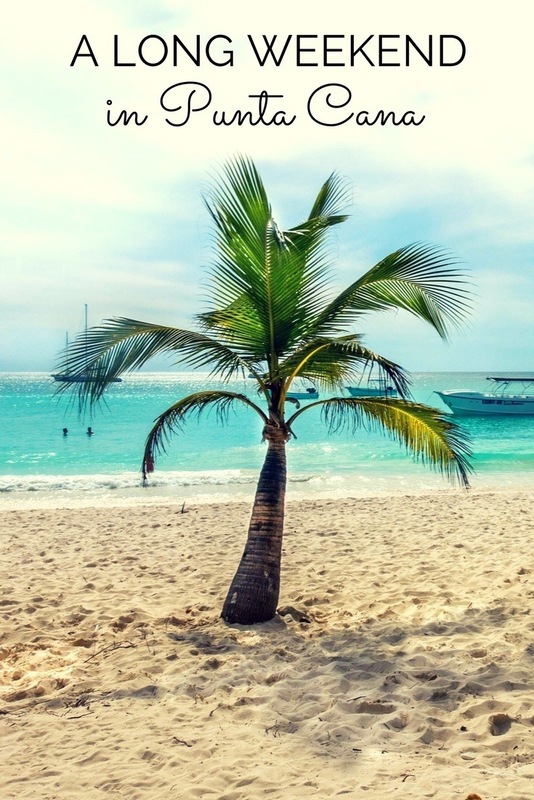 With 62 miles of coastline and the point where the Atlantic Ocean meets the Caribbean Sea, Punta Cana, Dominican Republic, is a beach lover’s dream. Punta Cana has numerous resorts where you can fill your time lounging by the pool or playing golf. 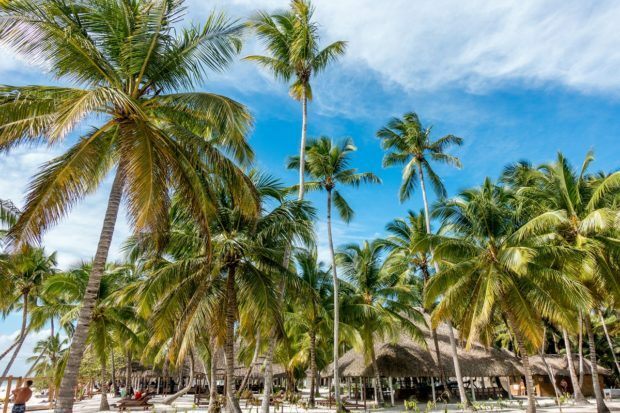 There are also plenty of fun things to do off-property, too, that give you a chance to explore all the beautiful things the Dominican Republic has to offer. Here’s a look at some of our favorite Punta Cana activities. Nothing says relaxation like being pampered on a spa boat in the middle of the Caribbean. 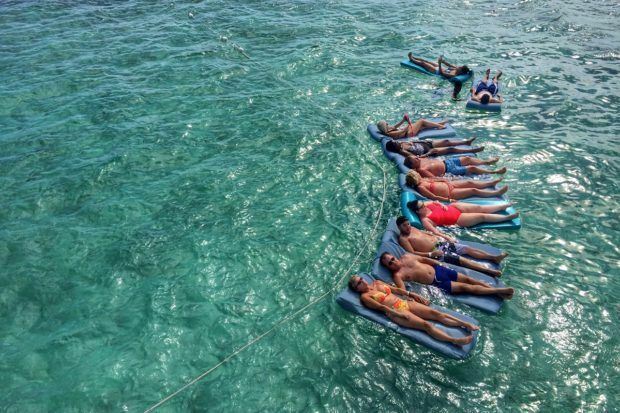 After a “doctor fish” pedicure on shore (tiny fish scrape rough patches from your feet), you adjourn to the floating spa for several blissful hours with professionals from Dr. Fish Ocean Spa. 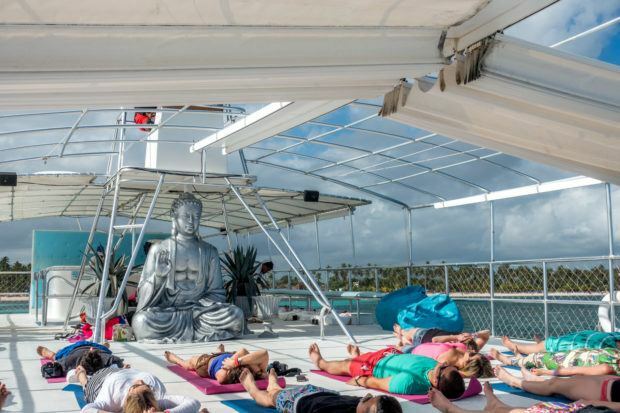 The ocean part of the experience includes a brief yoga session on deck and an amazing massage, followed by time on a roller massage bed. It’s impossible not to be relaxed. If that weren’t enough, there is also a coffee-and-honey body scrub to awaken your senses, plus our favorite part–a dip in the ocean (needless to say, you should come wearing a bathing suit). After the treatments, a lunch (and wine!) are included before your return to shore. 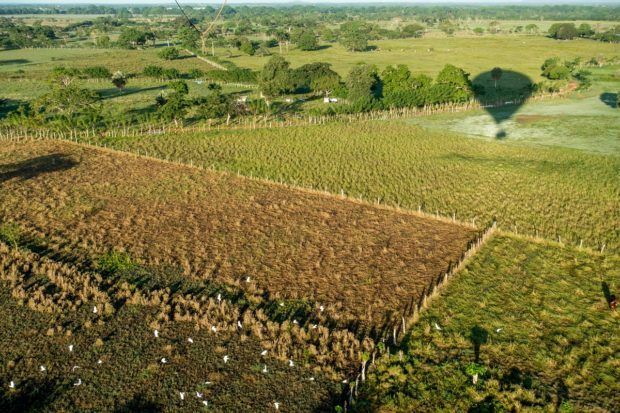 Flying over the landscape in a hot air balloon is one of the most unique ways to see a destination. 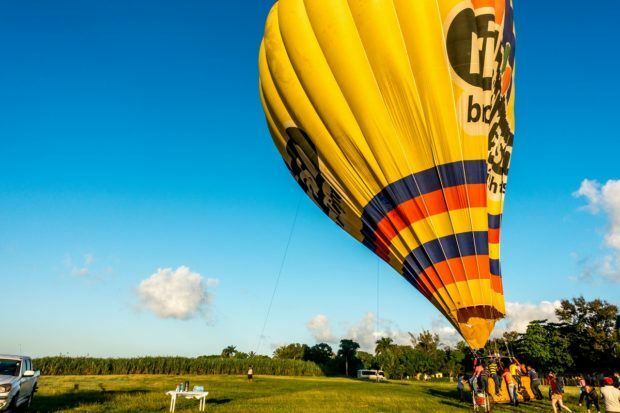 And, in Punta Cana, it’s even more unique because Dominican Balloons is the only hot air balloon company in the Caribbean. On your hour-long ride, you’ll see the beautiful countryside, float over sugarcane fields, and watch the activities of life going on below while you sail along in the breeze. After the ride, you get treated to fresh fruit and homemade cheeses for breakfast and, of course, a champagne toast to celebrate. This is–without a doubt–one of the most special activities in Punta Cana. A day trip to Saona Island is one of the best activities near Punta Cana. 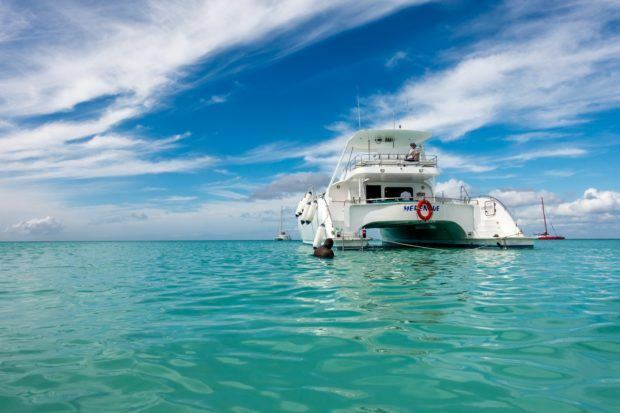 The trip begins with a boat ride to a natural pool in the middle of the Caribbean Sea where you can swim and snorkel, gazing at the starfish and other sea life that call this area home. If you opt for the private yacht option like we did, you’ll have plenty of snacks and rum drinks along the way, too. The boat ride and swim alone would be enough to make a perfect day, so arriving at beautiful Saona Island really puts the experience at the top of the must-do list in the Dominican Republic. Located in a national park, Saona Island is full of gorgeous palm trees and surrounded by some of the most pristine water in the Caribbean. It’s often used as a movie location for the quintessential island setting, and it’s easy to see why. Once at the island, there’s plenty of time for relaxing by the ocean, swimming, and enjoying a catered lunch. Grab some coconut water (in a fresh coconut, of course) for the boat ride home. 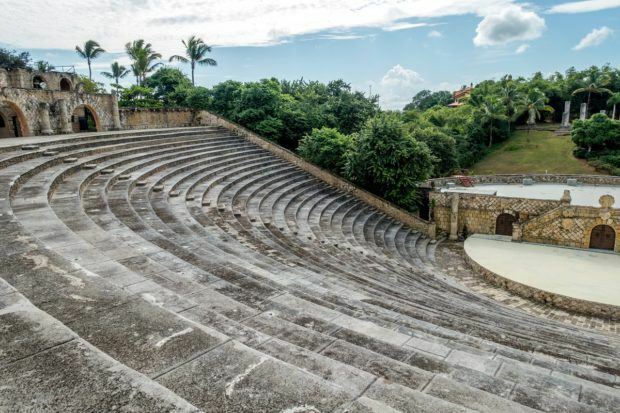 The Dominican Republic has plenty of shopping destinations but none more unique than Altos de Chavon within the Casa de Campo estate. The replica 16th century Mediterranean village features jewelry, fashions, and handcrafted items in its boutiques and one-of-a-kind shops. Active artists’ studios dot the cobblestone walkways where you can watch everything from textiles to pottery come to life. The village, its archaeological museum, and 5000-seat amphitheater also serve as a cultural center for residents and tourists. 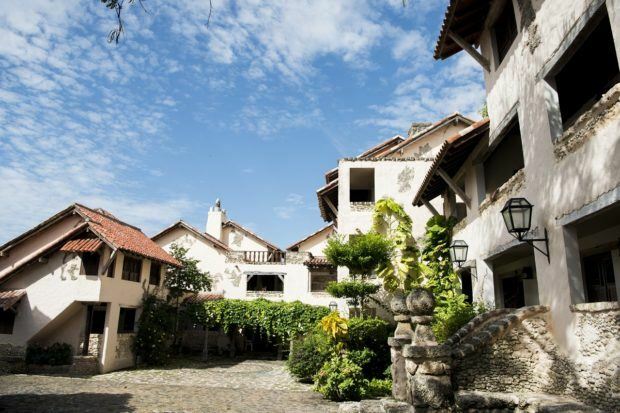 Just steps away, the Altos de Chavón School of Design – affiliated with New York’s Parsons School of Design – trains artists from the Dominican Republic and around the world. When you’ve had your fill of shopping and culture, head to one of the many restaurants and bars at Casa de Campo like the Beach Club by Le Cirque where you can dine overlooking the water. Their grilled octopus and watermelon salad was one of the best things we had in Punta Cana. One of the best Punta Cana activities is doing nothing at all. There are plenty of beautiful public beaches to visit, or you can stick close to your hotel. The Punta Cana region is full of all-inclusive options where you can while the day away barely having to lift a finger. 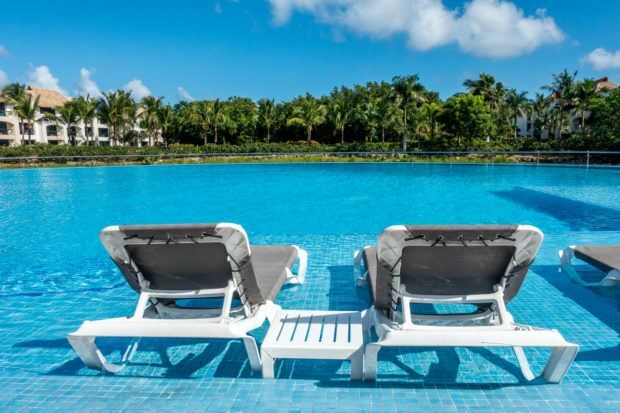 At the Hard Rock Punta Cana, the biggest decision of the day is which one of the 13 pools to try…or whether to head to the beach. At the CHIC by Royalton, the dilemma is how many of the 12 restaurants and lounges you can visit in a day. 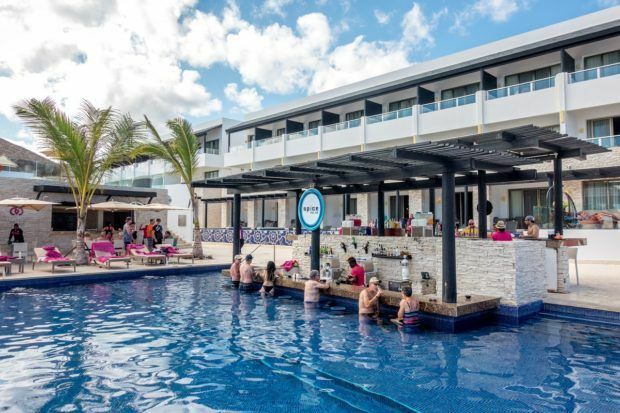 Of course there are also spas, nightclubs, casinos, and plenty of other activities to ensure you get the most from your long weekend in Punta Cana. We were the guests of the Dominican Republic Ministry of Tourism. All opinions of the serene and beautiful are our own. The photo of Altos de Chavon village is courtesy of Nick Argires on behalf of GoDominicanRepublic.com. 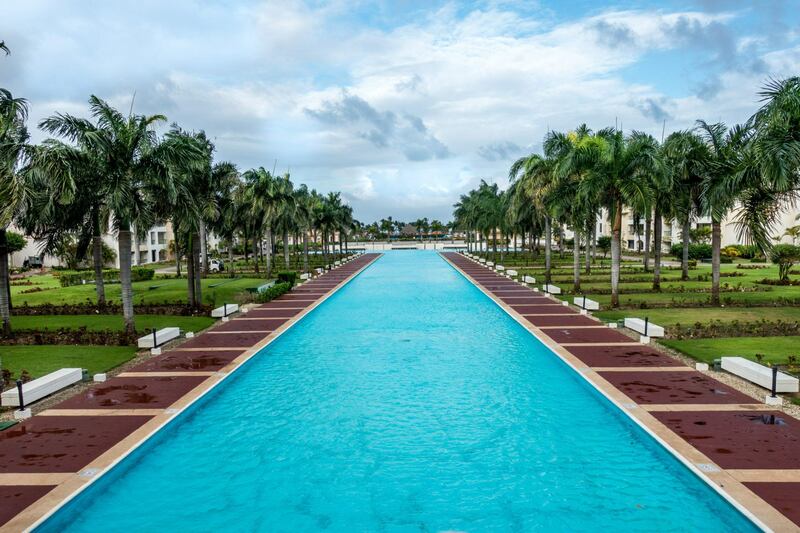 What do you think about Luxury and Leisure on a Long Weekend in Punta Cana? So I went to the Punta Cana over 10 years ago for a big family reunion and we had a blast, though we never left the resort and I kept wondering if I can still say I went to the DR. But now I am looking to go back for a family reunion again and to do the hot air ballooning sounds awesome. How much was it? Also, how did you get to Altos de chevron? Hi, Eric — The hot air balloon is $275 per person. If you’re not renting a car, I would suggest booking a tour to Altos De Chavon. TripAdvisor can be a good bet, or many of the hotels provide tour booking services. Have fun!